Rahul (131), Nair (130) help Karnataka reach 323 for 5, and take a 189-run lead. NOW, the ramp shot is no longer a novelty. Being surprised by it would be akin to raising an eyebrow over seeing your mother use WhatsApp on her smart-phone. For, you can find it being attempted everywhere, from the World Cup arenas Down Under to your neighbourhood maidaan. And it’s no longer bracketed as a Sehwag or a Dilshan shot. Every batsman worth his salt, at international level or otherwise, prefers to possess the ramp – a glide over the slips that is played with the bat angled at around 45 degrees – in his repertoire. But still, Karun Nair couldn’t disguise the wonder, almost awe, on his face when he saw his batting partner pull off a perfect rendition of this oft-used yet avant-garde batting invention. He stood there as if he had just heard a Carnatic musician try his hand at Punjabi rap. KL Rahul is still 22, but somehow it’s difficult to think of him as being anything but a traditionalist. A budding Test star in the T20 era but one oozing with the old-school charm of the village greens. Yes, Rahul was past his three-figures by now. He had brought up yet another first-class ton against a hapless Tamil Nadu attack, who had made the Wankhede Stadium wicket resemble a batting-friendly runway. But still Rahul playing the ramp? Maybe what got Nair’s goat was the fact that his comparatively docile fellow Karnataka right-hander had played a shot that would ideally have been expected of him, when he on the other hand was busy grinding Tamil Nadu into the dust more like a surgeon with a penchant for precision than a butcher scything through them, which is pretty much what he’s known for in the IPL world-one that Rahul is yet to make a significant impression in. Rahul didn’t seem to make much of the boundary that he’d just scored in an area, which you are unlikely to find populated in his wagon-wheel on most days. He had worked hard enough to deserve this moment of audacity. That too despite being handicapped with a pulled hamstring for a major part of his innings, and for every second that he spent in the middle on the second day of the Ranji Trophy final. The role reversal though was brief. In fact it lasted all of one delivery, even if Rahul did score at a strike-rate that was almost 20 runs quicker than Nair overall, and was also the only Karnataka batsman to hit a six on Monday. Having rid himself of his inhibitions for the ramp shot, Rahul returned to his natural style of play. Nair, meanwhile, continued to plug away, mixing sturdy defence while intermittently displaying his attacking prowess whenever the Tamil Nadu bowlers got it wrong. Eventually, he batted through the day, facing 295 deliveries and bringing up his first century of the Ranji season, finishing unbeaten on 130. Rahul finished the day, literally on one leg but still unbeaten on 131. And by stumps on Day Two, the two distinctly fashioned batsmen ensured that Karnataka had more or less defended their Ranji crown with the defending champions’ score reading 323/5, with a first innings lead of 189 and three days still to go. When Rahul had ambled off on Sunday evening, he’d left Karnataka reeling and in trouble of going the Tamil Nadu way of collapsing in a heap. But following an impressive night-watchman sojourn by Abhimanyu Mithun, he joined Nair at the crease with the opposition total still 50 runs away. That was probably the last time Tamil Nadu were even allowed to remain a competitive part of the match. And they withered away from that point on, even if Rahul was struggling to rotate the strike owing to his injured leg. The pace of the match itself was not electric and was limping at a rather awkward rate, but Rahul-who only two months ago had won the hearts of the Australian public with a century at the SCG-lit it up by hobbling his way to a century, of course with an occasional spurt of unexpected aggression. 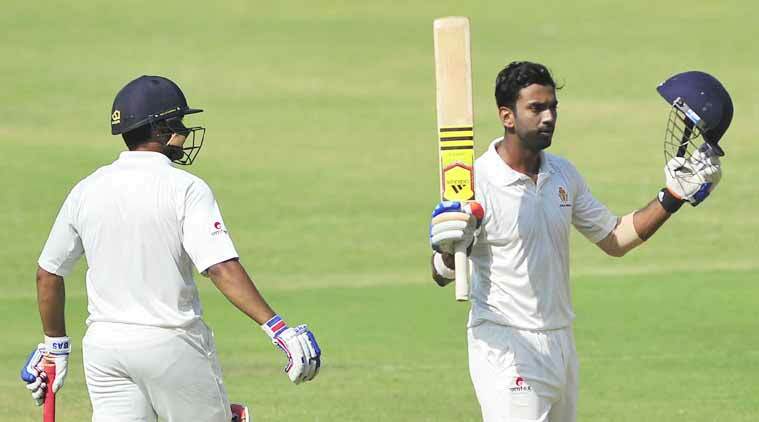 Brief Scores: Tamil Nadu 134 vs Karnataka 323/5 in 99 overs (KL Rahul batting 131, K Nair batting 130; LBalaji 3/68).